Mr. Trump is making China great again. Everybody now is doing more business with China because we're slapping them in the face and cutting them off. If you go to Moscow airport it is full of Chinese. Five years ago you couldn't see the Chinese. Now they're everywhere. They are all being pushed together by Mr. Trump and hs policies. If we're talking about America there are lots of pension funds which basically are bankrupt right now some of that may come out before long some pension fund may call up tomorrow and say we cannot pay any more I don't know where it's gonna start. I am not keen on cyber currencies. There is no question that the computer and the internet is changing everything we know and there's no question that money will be on the internet someday. I am skeptical whether it's going to be in any of the crypto currencies for a variety of reasons. But even if it's in one of them whether it's Bitcoin or one of the rest is questionable. Bitcoin and blockchain are two entirely different things. Blockchain is changing and it's going to change everything we know about the world. I wish I could find a way to invest in blockchain I have not so far. It certainly is going into extra innings. The last bear market or economic hard time was in 2008-2009. So it's been over 9 years since the last one. That historically is an anomaly. We usually have problems in America every four to eight years, so this one is lasted longer than usual. I've been hearing the manipulated gold story for 35 years now. Maybe it's manipulated, I don't know. Who's doing it if it's manipulated? The gold manipulation story's been around literally for 35 years. Everybody has to stay with what they know or you are gonna get wiped out if you listen to other people going into the next bear market. I guess probably not gonna start today, it's probably gonna be awhile but it's coming right. A very interesting story from the past. 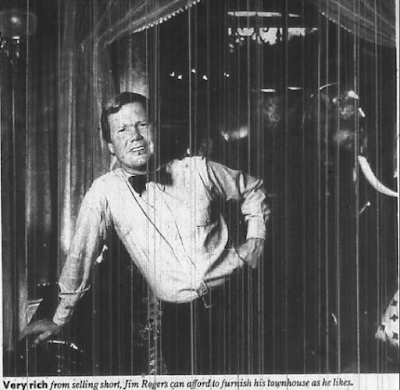 A newspaper describes Jim Rogers as a semi retired shortseller. 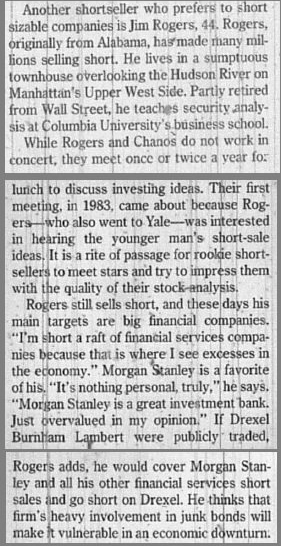 When this story was published Jim Rogers was 44 years old (more than 30 years ago). Jim Rogers updates his outlook for commodities in this video interview with Platts. My daughters are 10 and 15-years old and they will probably never go to a bank or a post office or a doctor. (In the future) we won’t be able to send letters or cash a check, as these institutions will simply cease to exist. We will operate in a totally cashless society. It's been ten years or nine years depending on how you count since our last bear market that's an unusually long period of time. The next bear more it's gonna be the worst in our lifetime. You think the Chinese are just sitting around? China’s a huge buyer of American agriculture, so of course that’s the obvious place to hit back because that hurts Mr. Trump the worst. It’s not Americans, it’s Trump. Trump and his guys, those are the ones they have to hit. The next bear market is going to be the worst in my lifetime just because of the debt but if we also have a trade war, it’s going to be worse than a disaster. I’m extremely concerned. I’ve read enough history and been through enough markets to know that trade wars are usually a disaster.